This July, ZKM | Center for Art and Media in Karlsruhe will open the first such extensive presentation of the Polish Radio Experimental Studio, an important centre for the creation of exciting electro-acoustic music in the Eastern Bloc. In 1957, the Polish Radio Experimental Studio (PRES) first opened its doors in Warsaw, and would very soon become an important European centre for the creation of original electro-acoustic music. For several decades under the communist regime, it offered artists a space of artistic autonomy and creative freedom. Next to the Warsaw Autumn International Festival of Contemporary Music, PRES was the only institution which enabled international artistic exchange on such a large scale, hosting guests from the USA, Western Europe or Scandinavia. Thanks to state-of-the-art technology and two qualified, experienced engineers, the Studio could meet the needs of composers representing various backgrounds, encouraging research into tape music in particular. Nevertheless, the Studio was not devoted exclusively to producing independent electroacoustic pieces but was also used to create musical 'illustrations' for movies, radio and television. In fact, creating incidental music, as well as what today we would call sound designing for various media, was officially one of the Studio’s main tasks. That meant the electroacoustic experiments in Polish Radio’s headquarters in Warsaw deeply influenced not only the development of art music around Europe but also changes in the popular culture and imagination throughout the Eastern Bloc. The studio was a space for meetings between engineers, such as Eugeniusz Rudnik, Bohdan Mazurek, Barbara Okoń-Makowska, Wojciech Makowski, Ewa Guziołek-Tubelewicz, Tadeusz Sudnik, and composers. Among the members of the latter we should note: Włodzimierz Kotoński, Krzysztof Penderecki, Bogusław Schaeffer, Elżbieta Sikora, Krzysztof Knittel, Hugh Davies, Arne Nordheim, Kare Kolberg, Lejaren Hiller, Roland Kayn and Dubravko Detoni. Subsequently, the Studio was expected to develop into an interdisciplinary institute of new media. The members of the PRES continually attempted to spread and promote new forms of music, organising lectures, producing series of radio broadcasts and publishing papers on the subject. It became a laboratory also for visual artists and designers such as Oskar and Zofia Hansen, Krzysztof Wodiczko, Kazimierz Urbański and Józef Robakowski. The Through The Soundproof Curtain exhibition at the ZKM | Center for Art and Media in Karlsruhe will present PRES as an institution oriented towards audio-visual experimentation, constantly looking forward. Being influenced by visual arts and happenings, artists and composers, the PRES managed to establish a new language that is open to the listener’s interpretation. EXPERIMENTAL Listen to the PRES episode of our podcast! When asked to compose music inspired by the classic works by Eugeniusz Rudnik, I was electrified by the unconventional use of voice and field recordings in his compositions. I have used such sounds ever since I started composing. The constantly evolving set of specific samples that I use while improvising at concerts has a lot in common with Rudnik’s sound universe. The contemporary relevance of Bohdan Mazurek’s works has become the source of inspiration for Valerio Tricoli. While Maja Ratkje uses only contemporary electronic tools (along with her voice) in her work, the Italian artist has employed, with a dazzling display of virtuosity, an archaic Revox-brand reel-to-reel tape recorder. This close relative of the 'instruments' chosen by Rudnik and Mazurek years ago, has now been used in real-time variations of the original recordings. As much as Rudnik and Mazurek remained faithful to the analogue domain, the younger artists of the Experimental Studio were eager to follow new trends in employing tools and aesthetics arising from the development of digital technology. Krzysztof Knittel shows a strong preference for a wide variety of performative actions, ranging from an electroacoustic improvisation to audiovisual happenings. His latest work – free for(m) macwin – is essentially a unique digital instrument. The exhibition Through The Soundproof Curtain will open with a performance by Krzysztof Knittel, Maja Ratkja and Valerio Tricoli. During Museum Night at the ZKM | Karlsruhe, visitors to the PRES exhibition will be given a unique opportunity to compose their own electroacustic pieces referring to the Bogusław Schaeffer’s original notation from his Symphony of Electronic Music. 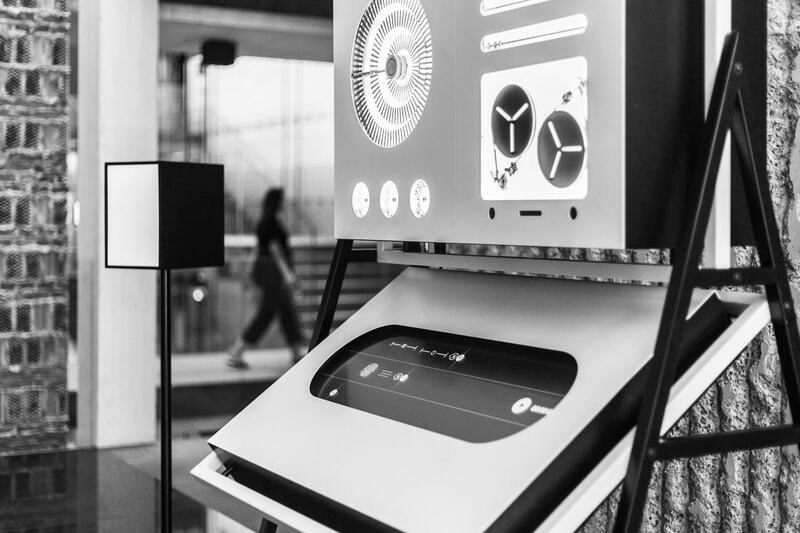 The interactive installation has been designed by the panGenerator collective as commissioned by the Adam Mickiewicz Institute, drawing on the heritage of the Polish Radio Experimental Studio. The spatial form of the object has been inspired by aesthetics of the famous 'Black Studio' (the studio’s headquarters) designed by Oskar Hansen. The project is co-organised the Adam Mickiewicz Institute as part of POLSKA 100, the international cultural programme accompanying the centenary of Poland regaining independence. Co-financed by the Ministry of Culture and National Heritage of the Republic of Poland as part of the multiannual programme NIEPODLEGŁA 2017–2021.